In this short overview of future technological advances in cardiac computed tomography (CT), we focus on technical challenges in cardiac CT – temporal resolution, spatial resolution, and low radiation dose. We show how they have been addressed so far and where technical progress may lead us in the future. 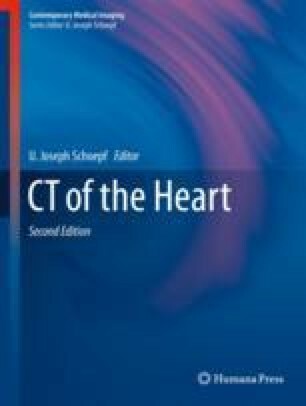 Then, we introduce new CT system concepts that may be promising for cardiac CT. Finally we briefly touch new aspects of cardiac CT imaging, aimed at deriving more than just anatomical information from a CT scan of the heart. Coenen A, Rossi A, Lubbers MM, Kurata A, Kono AK, Chelu RG, Segreto S, Dijkshoorn ML, Wragg A, van Geuns RM, Pugliese F, Nieman K. Integrating CT myocardial perfusion and CT-FFR in the work-up of coronary artery disease. JACC Cardiovasc Imaging. 2017. pii: S1936-878X(16)30975–5. https://doi.org/10.1016/j.jcmg.2016.09.028.